In 1945, as part of the Occupation forces sent to postwar Japan Nick Zappetti, a native of Italian East Harlem, entered a world as strange as any he had ever know, In postwar Tokyo, however, he realised there were certain opportunities. He had a failed stint as a professional wrestler, and participated in a fumbled (but famous) diamond heist. He was deported but managed to return with the assistance of the Mafia. 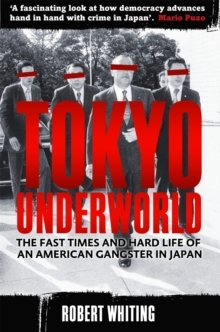 Then Nick opened a pizza joint in what would be the centre of Tokyo's nightlife and became "the king of Roppongi and Mafia boss of Tokyo," and the intimate of some of Japan's most notorious underworld figures as well as many of its political and business leaders. Following Zappetti's rising and falling fortunes, and his love-hate relationship with his adopted country, Robert Whiting show us the sinister (and sometimes ridiculous) goings-on among Tokyo's traditional criminal gangs as they developed from local racketeers and gamblers into lynchpins of international finance, politics and corruption. Here is a fresh perspective on postwar Japan and how it went from being a defeated nation to an economic player, with a little help from some less than diplomatic friends.